While other companies show drawings of the electric vehicles they plan to make or try to sell EVs that only movie stars can afford, Myers Motors puts Americans behind the wheel of its NmG (No More Gas) Personal Electric Vehicles. As a primary commuter vehicle, the highway legal, 75+ mph NmG proves electric vehicles provide practical transportation for the daily trips for work and errands when the driver usually travels alone. Myers Motors empowers ordinary people to lead the fight against that oil addiction today by letting them drastically reduce oil consumption now instead of waiting for a top-down answer in the future. and of automakers’ reluctance to embrace the EVs, as seen in “Who Killed the Electric Car?,” can intensify these feelings of helplessness. In contrast, the NmG provides people with a practical alternative to start making a difference now. 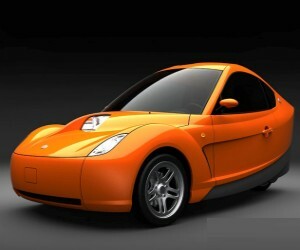 The single-passenger, three-wheeled NmG has outstanding acceleration and a range of 30 miles between charges. A unique driving experience is gained through the NmG’s low center of gravity and its power being delivered via the single rear wheel. The company calculates that a driver charged 11 cents per kilowatt will pay about 55 cents for the “fill up” that powers the NmG for about 30 miles. The pollution-free NmG fully recharges in 6 to 8 hours using a 110-volt outlet and less than half that time using a 220-volt outlet. The NmG’s amazing technology is priced significantly lower than advertised prices for vehicles the next closest competitors promise to make available in the future. The NmG comes in dazzling exterior colors. Standard amenities include audio system, adjustable bucket seat, accessory outlets, 6-cubic-foot trunk, power windows, and heater. 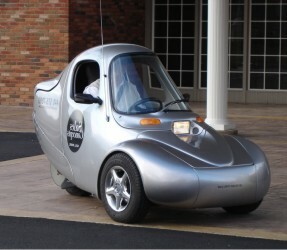 Myers Motors devoted more than a year enhancing key components of a ground-breaking electric vehicle to create the NmG. Myers Motors’ NmG keeps its ancestor’s stunning exterior unchanged while almost everything under its sleek shell has been upgraded to improve reliability and performance. Myers Motors’ team of workers proudly hand-builds each NmG with careful attention to detail. The vehicles are built at Myers Motors’ production facility in Tallmadge in northeast Ohio. For more information, contact Myers Motors at 330-630-3768 or visit www.myersmotors.com. No more Gas. Doesn’t use Oil. We have been looking to provide and many of you have been looking to buy a vehicle that doesn’t require the use of oil for many of your daily travel requirements. Our goal at Myers Motors is to provide this in a package that is affordable to buy, practical to use, fun to drive, and fun to be seen driving. For most people, we hit at least 3 out of 4 of these targets with our current NmG. Our goal was to get enough pre-sale interest to justify a profitable sales price of $24,995 for our two-passenger Duo. I am happy to announce that between pre-order interest and some engineering improvements, we are within $1000 of that figure. We believe we will be able to meet our target pricing by the time our Duo hits the street. Due to engineering changes that, we believe, will make the Duo even better, production will likely be delayed until 1st quarter of next year. I hope you think that the unique styling, no-rust chassis body system, two passenger seating that covers the occupancy needs for almost 9 out of 10 trips made in the US --- and which allows the vehicle to be light enough (while being strong enough) to be charged at night from our nation’s existing infrastructure at standard 110 volt outlets (and not requiring special chargers) is worth waiting for. For my part, I love driving my NmG, seeing people light up with enthusiasm and interest (and cameras) when they see it … and I love the less than 180 watts per mile that the NmG uses at highway speeds. Some NmGs are still available for sale … and for those who can wait, the Duo is just around the corner.